A gripping political thriller set a few years into the future when the EU has become a fully federal superstate. A political elite out of control. Brussels. The highest ranking Icelandic official at the United States of Europe, Solman Smithson, hears the voice of his old friend Krummi, who is fighting off armed guards. Krummi and Solman grew up together in the Westman Islands but while Solman became a bureaucrat, Krummi went to sea as one of Iceland’s last fishermen. The Vulture is looking down on its prey. The chance encounter takes place as the new president, Erich Devereux, is installed into power. But rumours circulate that corrupt votes put him in power. Murders and violent attacks on journalists and academics proliferate in an apparently unconnected way. And as momentum builds in Iceland for independence from the USE the tempo of violence and intrigue quickens. The Vulture moves toward its prey. Fate decrees that only the big fisherman from the Westman Islands stands in the way of the dark forces of chaos. But can a fisherman from Iceland work out what is really going on. And can he survive long enough to make a difference. "All in one; horror, thriller and critiquing, written with great ingenuity ... Political novel and futuristic thriller, a modern Orwell's 1984." Hrafn Jökulsson, one of Iceland's most prominent critics. 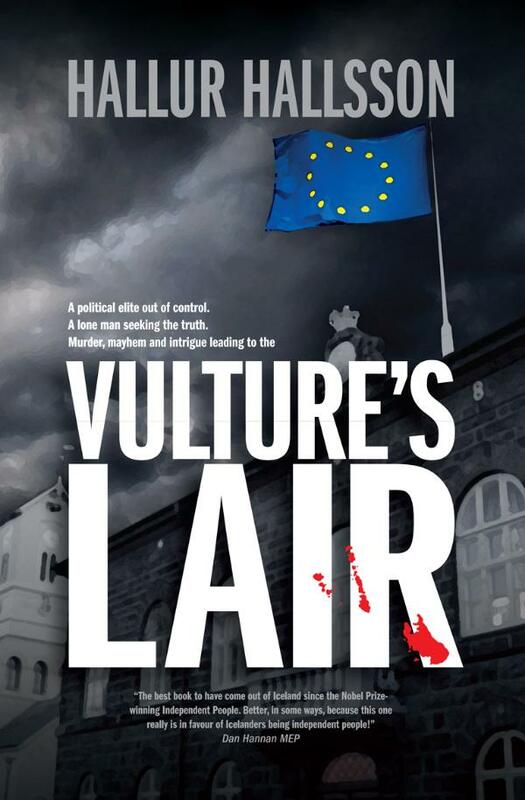 "Vulture's Lair is history, contemporary, futuristic and a thriller." Hallur Hallsson is born 1951 in Reykjavik. He graduated from the University of Iceland in English and History. Hallsson is a leading journalist and TV-personality in Iceland. Hallsson was one of the founders of the daily Dagbladid in 1975 which became the second biggest newspaper in Iceland. He was a leading journalist at the influential Morgunbladid and a journalist and anchor at Channel 2 and State Television. Hallsson is now a commentator on the TV station INN.TV. The Vulture‘s Lair is Hallsson’s first novel. You can watch a video interview with author Hallur Hallsson as filmed for INN, Icelandic TV station. While the lower video shows the Launch Event at the House of Commons with Bill Cash MP, Austin Mitchell MP and others.